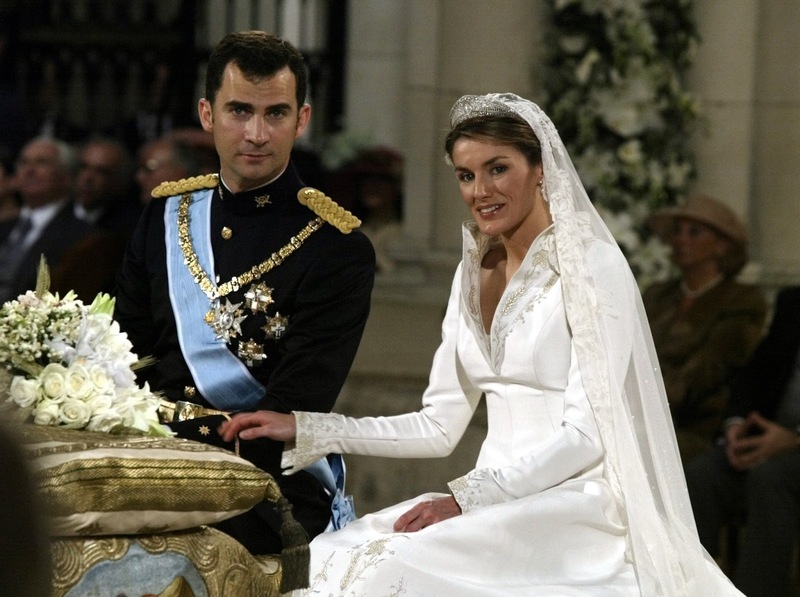 The gown, by veteran Spanish designer Manuel Pertegaz, is a very traditional royal wedding dress but not the style anyone expected from Letizia. At first glance it's very white and very structured with a huge train. The dress is made of natural silk and features lots of embroidery. There are fleur de lys, ears of wheat and flowers worked in gold on the sleeves, the skirt and the train as well as the collar. And it's perhaps worth starting at the top and working our way down with this dress because the collar is one of the things everyone remembers about Letizia's dress. It is high and opens out from a V shape in the top of the dress and with the veil it seemed to almost overwhelm the bride. The sleeves are long and fitted, opening out into a structured flare at the end while the body of the dress is also fitted with the skirt spreading out into a fuller shape at the end. The train is an integral part of the dress which is designed and made for the whole 15 feet of it to be part of the gown. It was a pretty impressive addition to the outfit and spread out into a sparkling swoop of fabric which filled the aisle of the Almudena as Letizia walked towards her groom and added all the grandeur that a royal wedding dress needs. There's no doubt that this is a classic royal wedding dress combining many of the elements familiar in other gowns - the embroidery, the coat dress effects and the long train. But all of it combined in Letizia's gown seemed to produce an outfit that wore the bride rather than the other way round. She looks beautiful but it's one of those dresses that just about everyone wants to alter just a little bit to make different. The dress has been displayed since and there is a lot to love about it. The embroidery is exquisite and the perfect rendering of the royal symbols of the life that Letizia was marrying into. The fabric is gorgeous and the train is a standout example of regal dressing. The feeling had been before the wedding that this style icon of a bride was going to produce a dress to remember up there with the icons of the regal marriage gown and this doesn't quite hit that mark. Perhaps expectations led to the questions being asked afterwards. This is a classic wedding dress with a twist but it just falls short of being a standout success. No matter, Letizia's standing as a royal fashion icon has gone from strength to strength.